On the outside, the New Hampshire mansion looked posh and impressive. 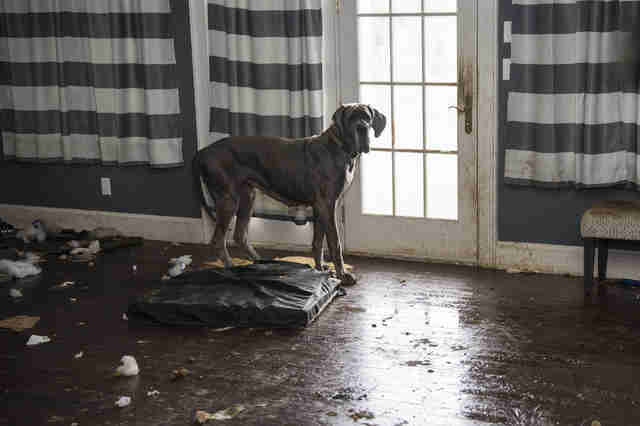 But the inside held a dark, sad secret — the homeowner was running a puppy mill, a commercial facility that breeds and sells dogs for profit, and she wasn’t properly caring for the dogs. 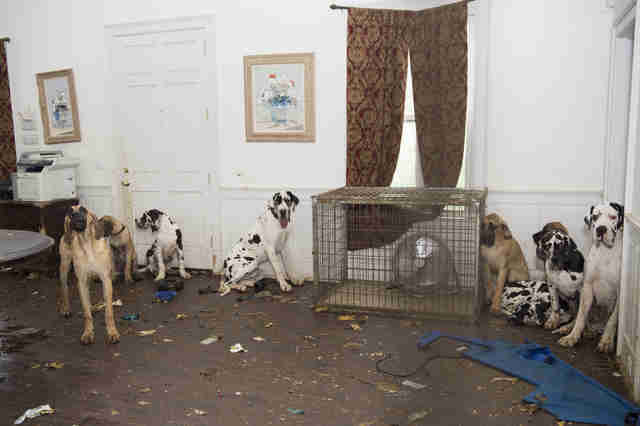 Eighty-four Great Danes were crammed inside cages or running loose throughout the house, which was covered from floor to ceiling in feces. 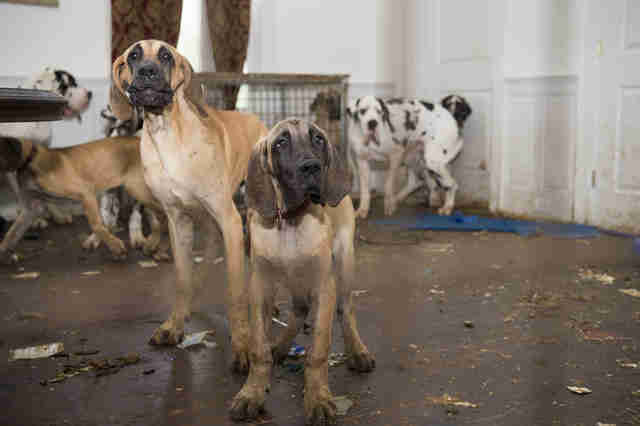 Many of the dogs were underweight, and had infections on their eyes and paws. There was no water available, and the only food was pieces of raw chicken scattered across the filthy floors. 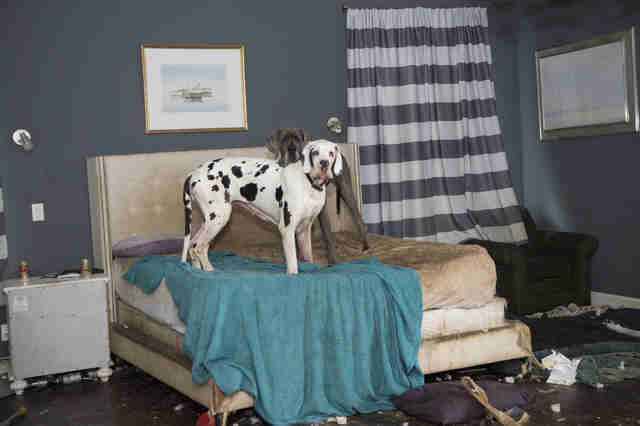 In June 2017, an animal rescue team from the Humane Society of the United States (HSUS) gained entry into the home, and they’ll never forget what they experienced in there. 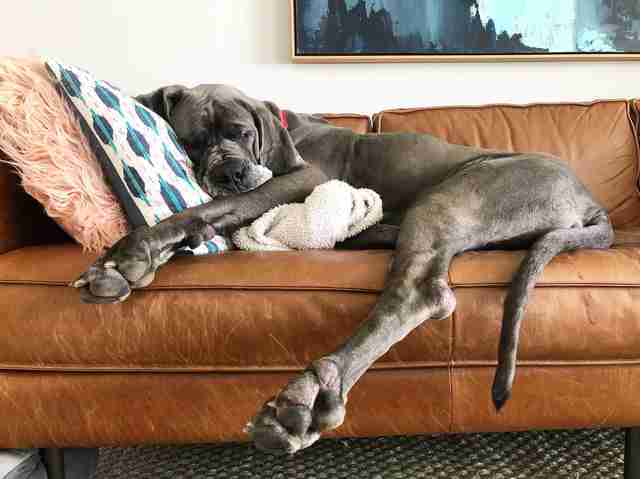 Many of the Great Danes were as “large as ponies,” but looked “sad” and “broken,” according to Pacelle. 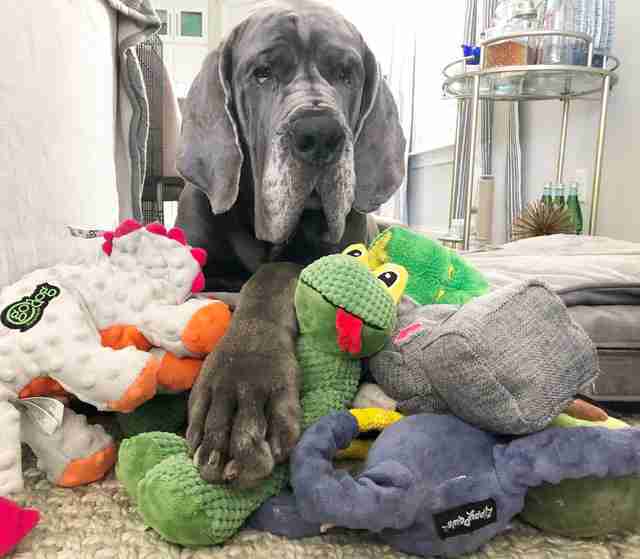 While most of the dogs were being kept in cages, two Great Danes were locked up in the owner’s bedroom, including a senior dog named Wanda. Wanda seemed a little frightened, but she quickly warmed up to the rescue team. 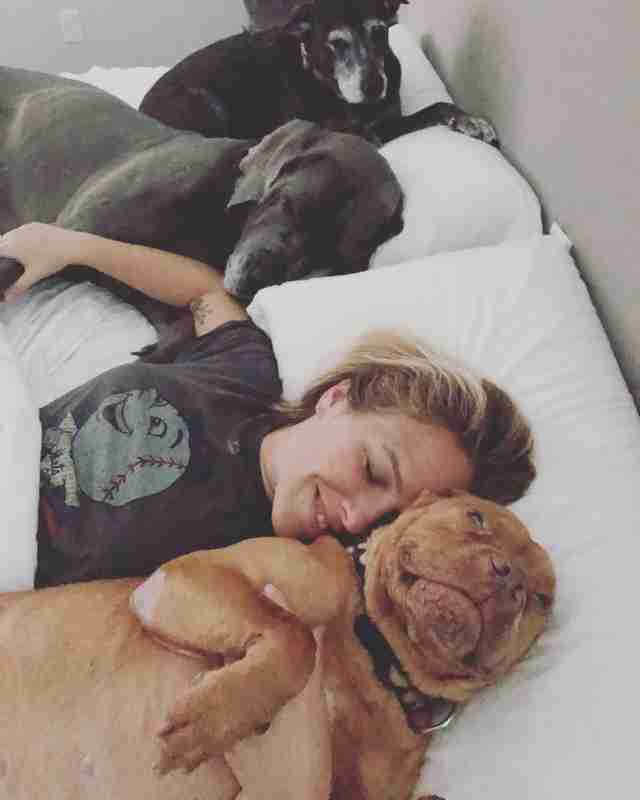 The team relocated the dogs to a safe but undisclosed location in New England, and the dogs had to stay there for the next 14 months while HSUS embarked on a legal battle to gain full custody of them. 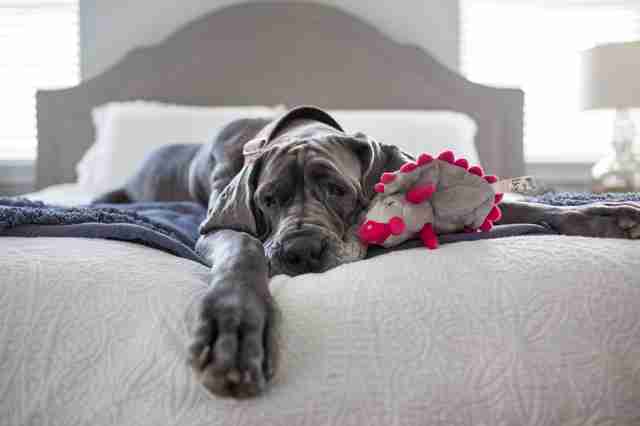 While waiting for the courts to decide the Great Danes’ fates, Morgan helped care for them at the shelter. During that time, Morgan formed a soft spot for Wanda — and Wanda was also falling hard for Morgan. 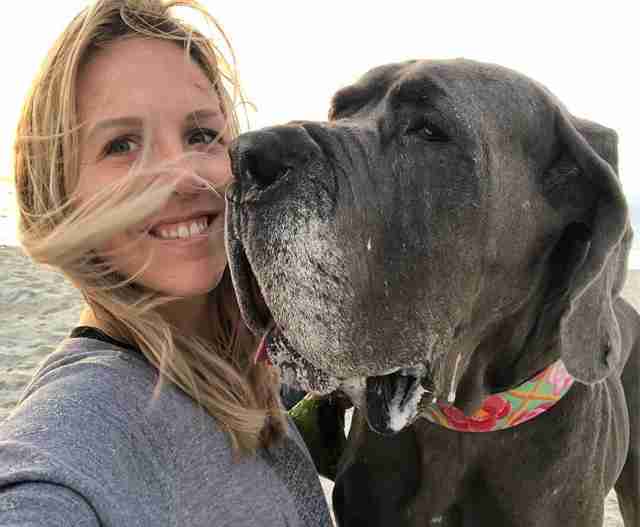 Morgan had a lot going on in her life at the time — her husband was due to get a liver transplant, and he’d need a lot of specialized care after his operation. But the more Morgan thought about Wanda, the more she realized Wanda was the perfect dog for her family. 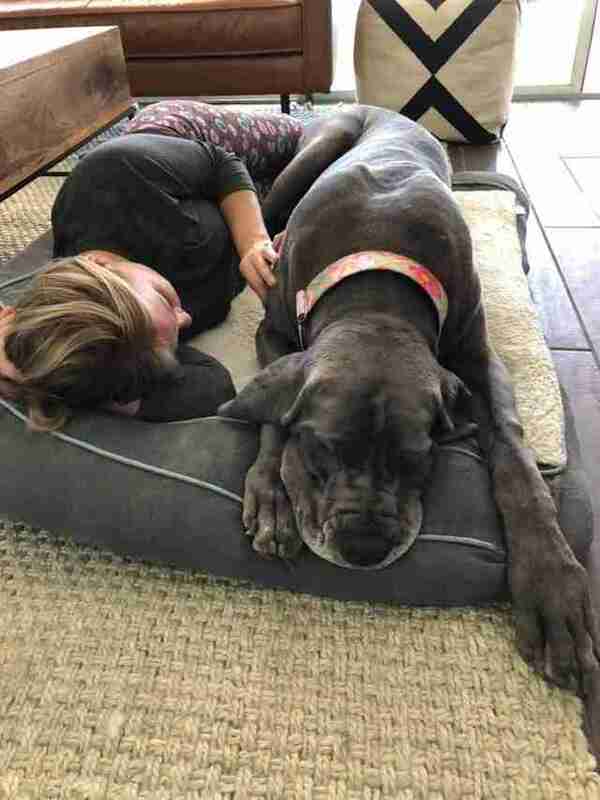 When HSUS finally gained legal custody of the dogs earlier this year, Morgan went ahead and adopted Wanda, bringing her home to live with her, her husband and their two other dogs and cats. “It was probably one of the best decisions I’ve ever made,” Morgan said. 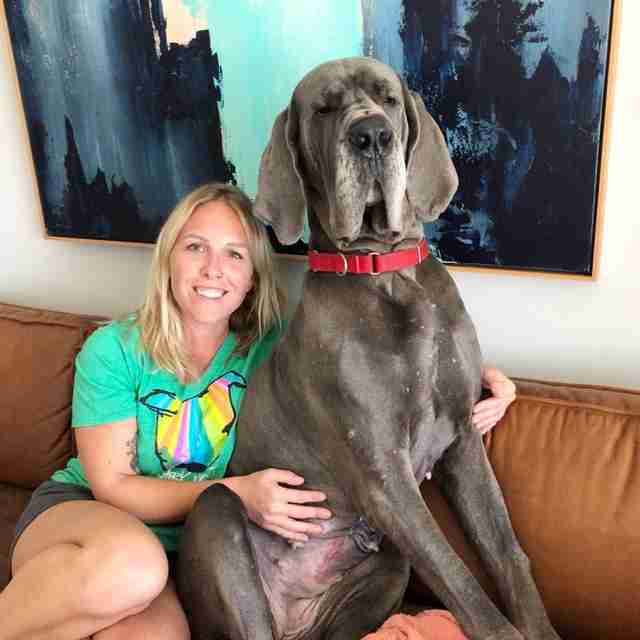 Wanda, who’s about 40 pounds heavier than Morgan, is attached to her new mom at the hip, and she follows her absolutely everywhere. Wanda has also been very attentive to Morgan’s husband since his liver transplant. Morgan has also seen big changes in Wanda’s behavior. Wanda’s become such a big part of Morgan’s life that she can’t imagine life without her — and Wanda likely feels the same. To help rescue more dogs like Wanda from puppy mills, you can make a donation to HSUS.